We are pleased to announce that we are selling tickets for our next evening, which will be based as a pop-up at the beautiful Treacle and Co. cafe, a much-loved Hove institution that shares our passion for high-quality, well-sourced food and drink. 5 courses and 5 paired wines for only £45! For tickets, please visit Treacle and Co. (164 Church Rd, Hove, BN3 2DL) or contact us at forgottengrapesclub@gmail.com. Follow @fgsupperclub for more updates! About the same land-mass as Wales, what Lebanon lacks in size it makes up for in cultural diversity and culinary prowess. Nestled in the fertile Levant in the east of the Med, Lebanon has its gastronomic roots in Ottoman cuisine but also draws heavily from neighbouring Syria, Palestine and Iran, as well as its more recent French colonial history. Think olive oil, lamb, aubergine, spices, pickles and nuts with a touch of the European. Lebanese wine is mainly grown in the fertile, low-lying Bekaa valley, From dry and fruity rosé's to buttery whites and bold, savoury reds, this small nation's wine stands tall alongside the Old World heavyweights. 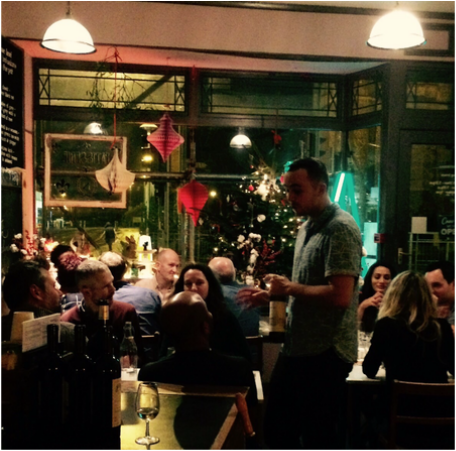 We run pop-up supper clubs that celebrate the world's forgotten wine regions. Countries like Lebanon, Georgia and Moldova, as well as regions such as Alsace, have been producing stunning wines for hundreds and in some cases thousands of years, yet are often left under-appreciated in today's wine world. Our evenings are part-wine tasting, part-dinner and offer the chance to learn about these forgotten wines and the art of wine pairing, all whilst enjoying inventive global food. Felix is the wine man. Originally from Cambridge but now living in Bethnal Green, Felix has been involved in the wine trade since he was 18. Currently working as a sommelier at the Hawksmoor, he also runs private and corporate wine tastings under the name Felix the Wine Guy. James is our chef. Currently working as a doctor and based in Brighton, he is passionate about world food and enjoys putting modern twists on traditional regional cuisine. Initially located in South London, our evenings have now relocated to Hove, East Sussex. Our venue and new collaborators is beautiful, independent cafe Treacle and Co.